But now Westerwelle has outed himself, not as a gay man, but as a diplomat. He has announced that he will not take his partner with him on trips to countries where homosexuality is a crime. Why? Because "we want to promote the concept of tolerance in the world. But we also don't want to achieve the opposite by behaving imprudently." One doesn't have to read his remark twice to understand what it signifies: Tolerance is a wonderful thing, but we shouldn't push our luck. This is more than the usual hot air from a politician. 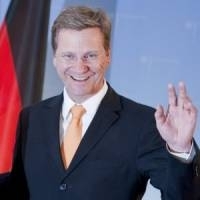 Westerwelle's words are an example of moral hara-kiri in slow motion, and they're a disgrace for Germany. Heavens, yes. We wouldn't want to offend any people who are putting homosexuals to death or anything. The people who hate homosexuals are still going to hate you, even if you don't bring your partner along. All you're doing is acting spineless in public.